Atakilt wat (a.k.a., atakilt alicha, ye’atakilt wot, etc.) is another one of my favorite Ethiopian dishes, made of humble vegetables: cabbage, potatoes, carrots and onions. Even though it’s rather mild, it’s still quite tasty. If you have a large enough pot, it’s easy to double this recipe. If you can find the spiced clarified butter nitr qibe (a.k.a., nitter kibbeh), do use it, as it adds a more flavorful dimension to this dish. But a vegetable oil, or ghee, will suffice. 1/4 cup nitr qibe, ghee, or canola oil, or a mix thereof. Heat the nitr qibe or oil in a large pot over high heat. Sauté the onion until translucent, about 10 minutes. Add the garlic and ginger, and stir for a minute or two until fragrant. Stir in the turmeric, tomato paste, cabbage, potatoes, carrots and salt. Cover, lower heat to medium-low, and cook until the thick vegetables have become tender, about 20 to 30 minutes. Stir every 5 to 10 minutes so that bits don’t stick and burn at the bottom of the pot. Adjust salt levels, if desired. 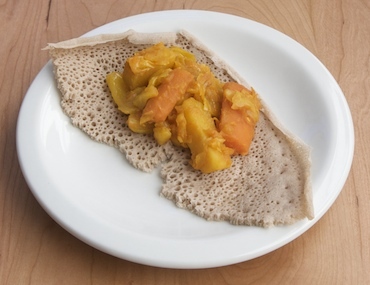 Serve with basmati rice, or a flatbread like injera. This was written by sairuh. Posted on Wednesday, June 30, 2010, at 1:12 pm. Filed under Food. Tagged Ethiopian, recipe, stews, casseroles, vegetarian. Bookmark the permalink. Follow comments here with the RSS feed. Post a comment or leave a trackback. Alas, I had bought the injera from an Ethiopian grocery store! Thank you for the recipe. I recently had the atakilt wat at an Ethiopian festival and loved it.They bought the injera too. Flawless! Followed your recipe exactly (which I never do) then added some ground (fake) meat for protein. Oh, then I added garlic chili paste to make it hotter. Mega hit and SUPER easy. Well done! I’m glad the recipe worked for you, Steph—thanks! Equal parts cumin and tumeric. Rhiannon, next time I make this, I’ll try adding cumin and more turmeric. Thanks!